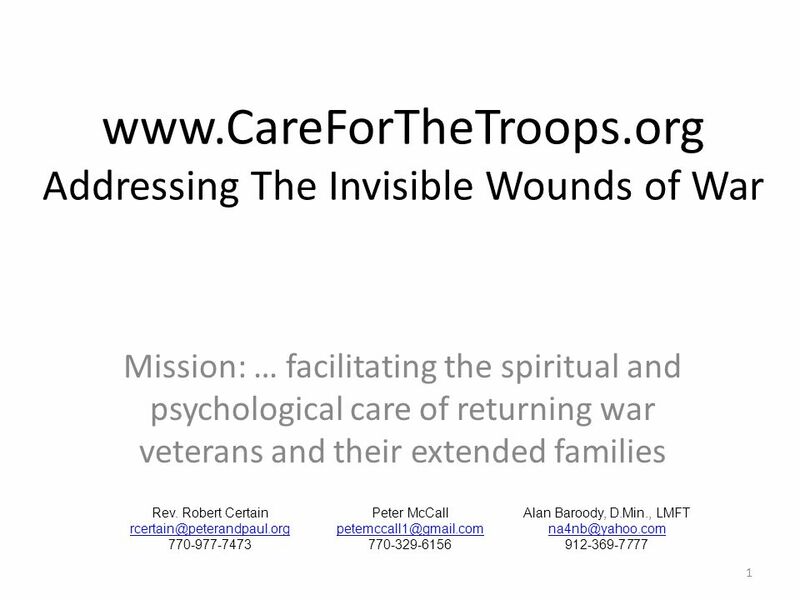 Www.CareForTheTroops.org Addressing The Invisible Wounds of War Mission: … facilitating the spiritual and psychological care of returning war veterans. 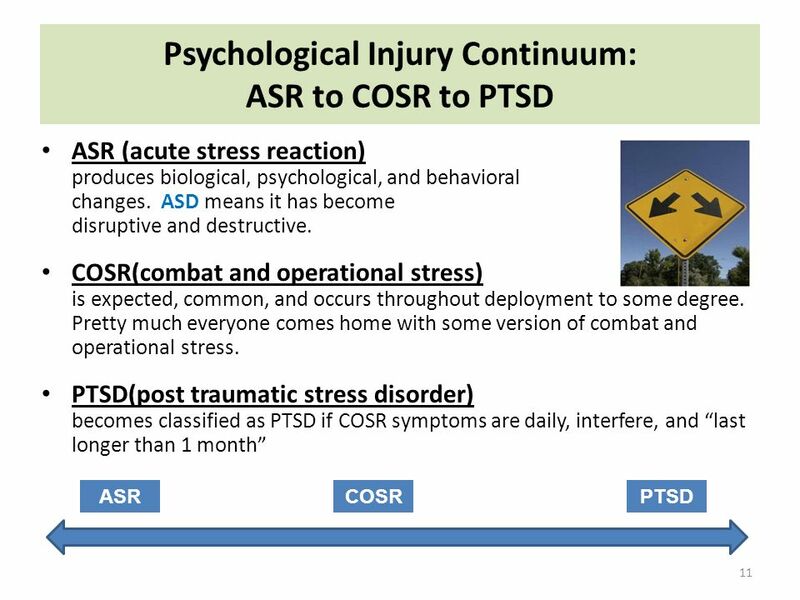 3 Causes for Concern 3 1.Multiple deployments are common causing stress and family attachment issues 2.An April 08 Rand Study reported 37% have either PTSD, TBI, or significant Mental Stress (5% all 3). 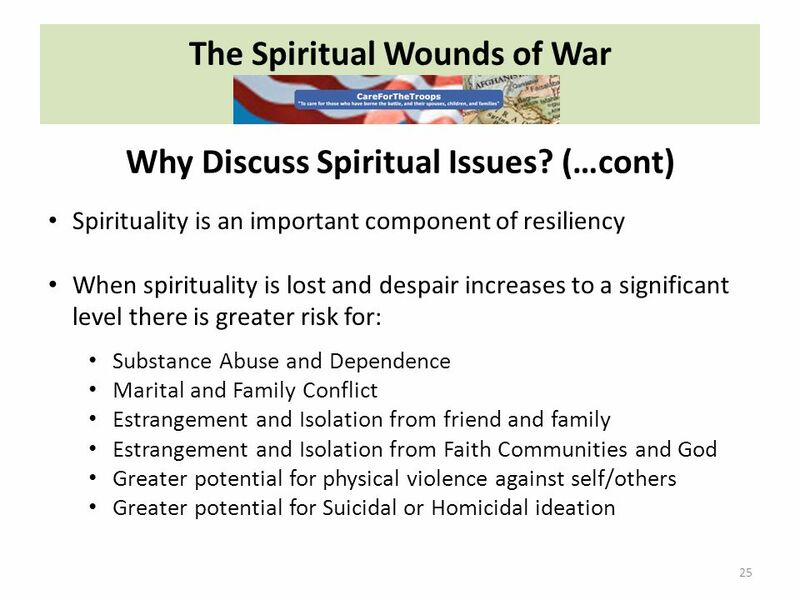 Some estimate >50% return with some form of mental distress 3.Suicide, alcoholism, domestic abuse and violent crimes rates are rising. Suicide is 33% higher in 07 over 06, 50% higher in 08, equal to 08 by May of 09. 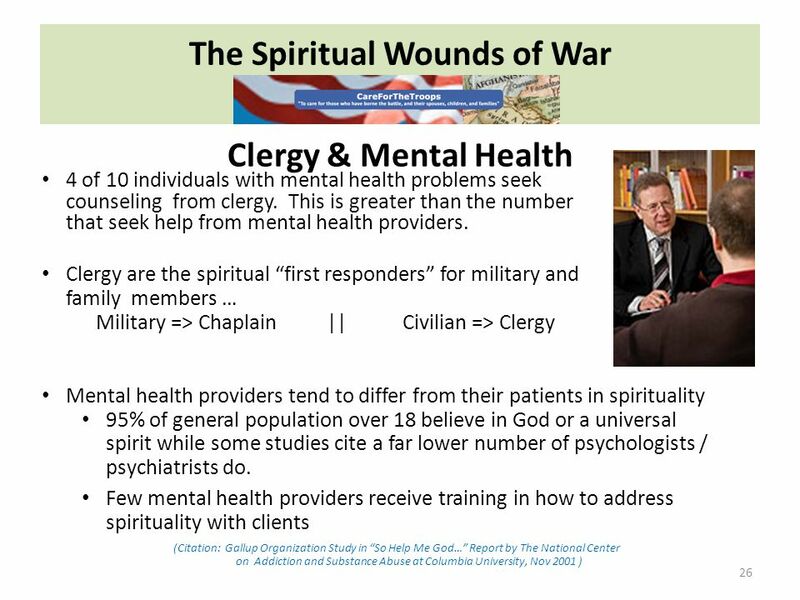 As of summer 2009, 761 killed in Afghanistan, yet 817 suicides in all services over the same period. 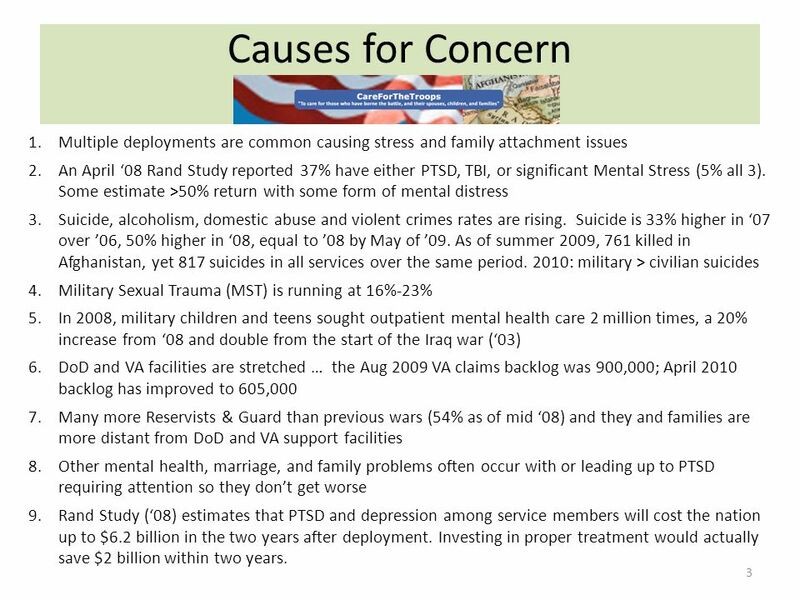 2010: military > civilian suicides 4.Military Sexual Trauma (MST) is running at 16%-23% 5.In 2008, military children and teens sought outpatient mental health care 2 million times, a 20% increase from 08 and double from the start of the Iraq war (03) 6.DoD and VA facilities are stretched … the Aug 2009 VA claims backlog was 900,000; April 2010 backlog has improved to 605,000 7.Many more Reservists & Guard than previous wars (54% as of mid 08) and they and families are more distant from DoD and VA support facilities 8.Other mental health, marriage, and family problems often occur with or leading up to PTSD requiring attention so they dont get worse 9.Rand Study (08) estimates that PTSD and depression among service members will cost the nation up to $6.2 billion in the two years after deployment. Investing in proper treatment would actually save $2 billion within two years. 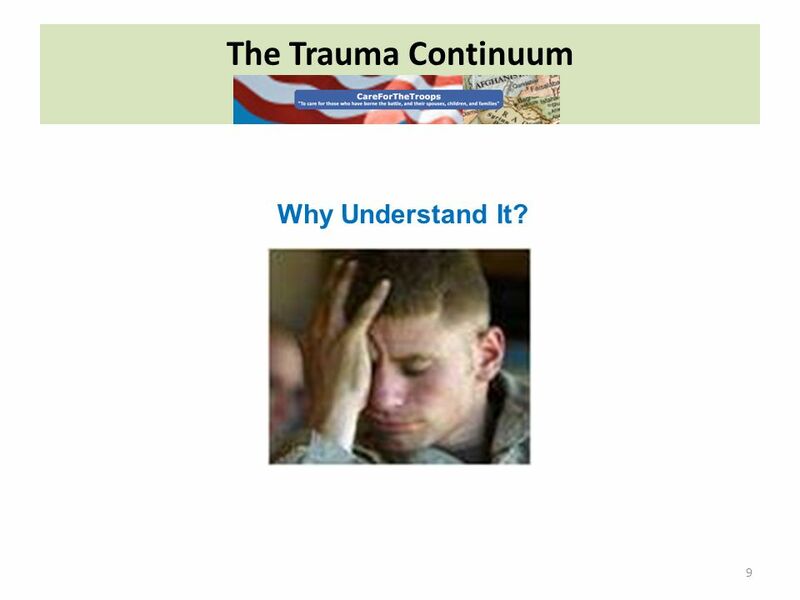 9 The Trauma Continuum 9 Why Understand It? 12 Where Does the Stress Come From? 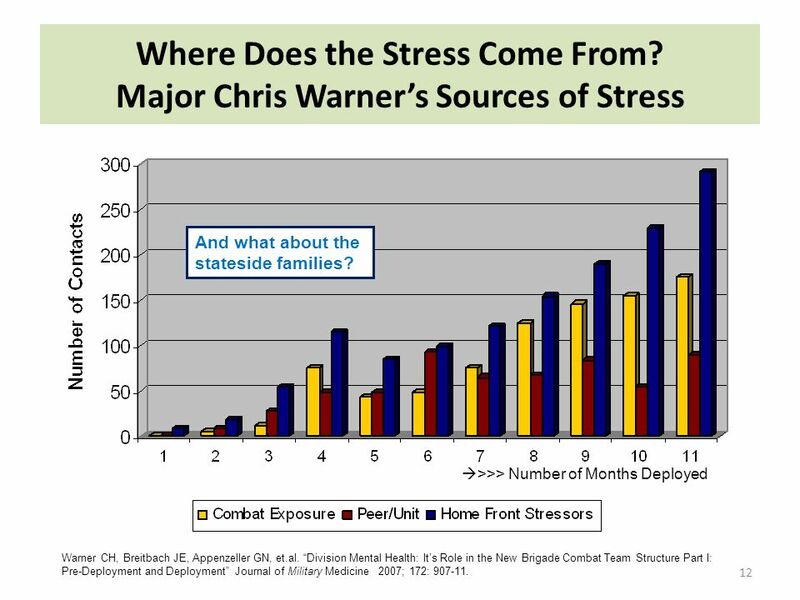 Major Chris Warners Sources of Stress 12 Warner CH, Breitbach JE, Appenzeller GN, et.al. 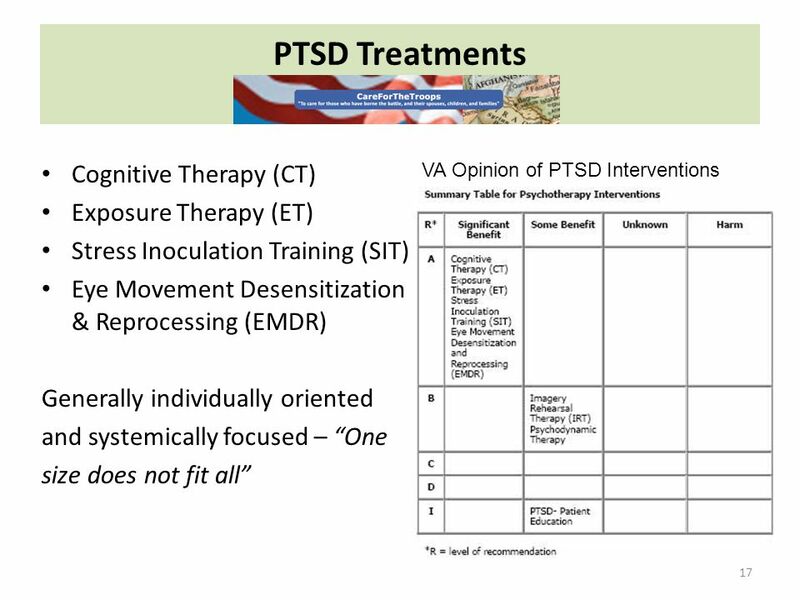 Division Mental Health: Its Role in the New Brigade Combat Team Structure Part I: Pre-Deployment and Deployment Journal of Military Medicine 2007; 172: 907-11. >>> Number of Months Deployed And what about the stateside families? 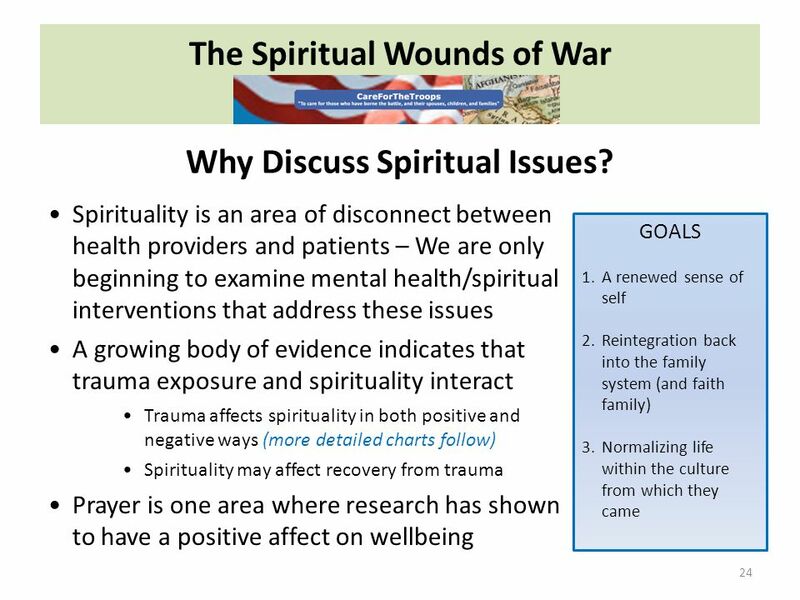 31 The Spiritual Wounds of War 31 Evidence for a relationship … continued Lack of forgiveness, and religious coping (- positive / + negative) are related to more severe PTSD and depression in outpatient veterans treated for PTSD Witvliet, C. V. O., Phillips, K. A., Feldman, M. E., & Beckham, J. C. (2004). 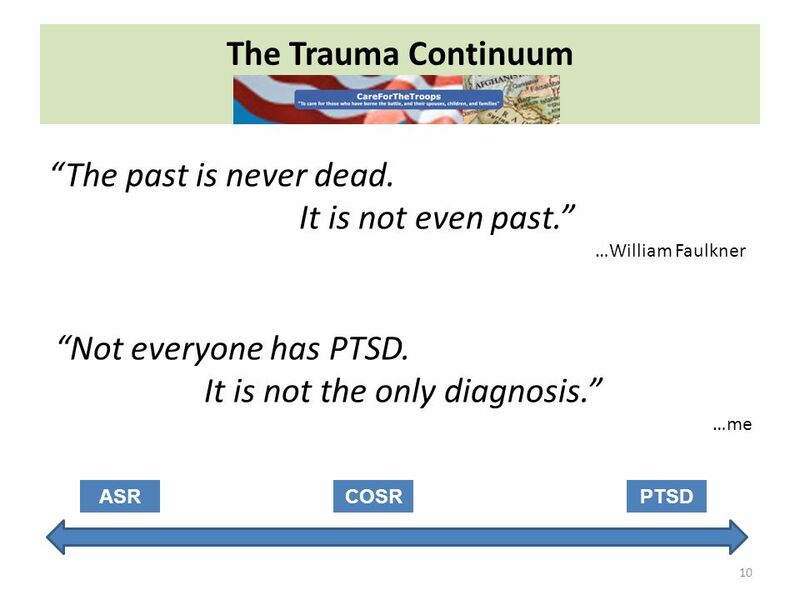 Within PTSD group lack of forgiveness, is associated with worse PTSD severity, and worse depression. 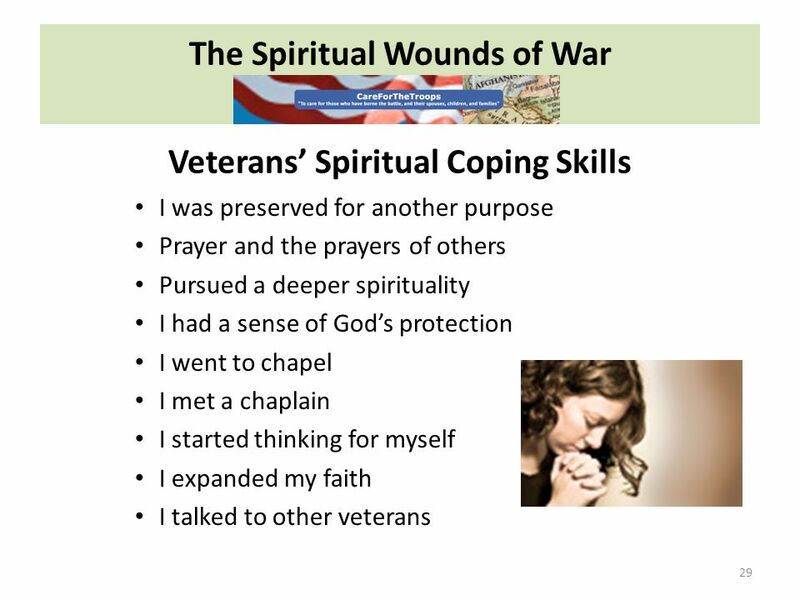 Negative religious coping associated with worse depression. Drescher, K.D. 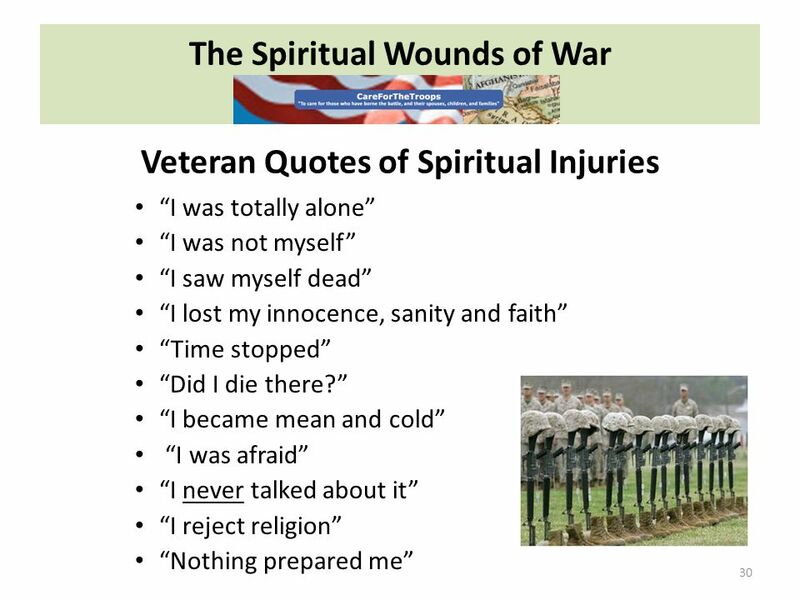 Ramirez, G., Romesser, J., Rosen, C. S., Foy, D.W. Veterans' warzone experiences (killing, losing friend) weakened their religious faith, both directly and as mediated by feelings of guilt. 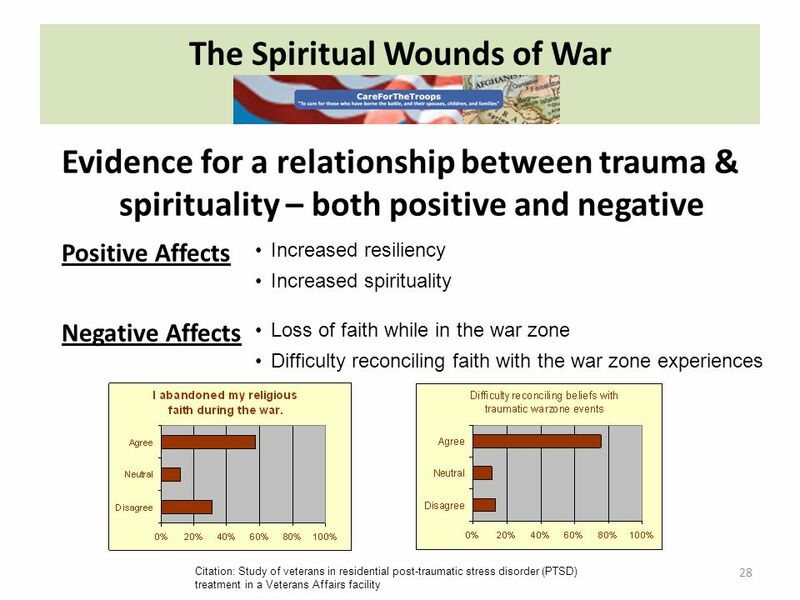 Weakened religious faith and guilt each contributed independently to more extensive current use of VA mental health services. Fontana, A., & Rosenheck, R. (2004). 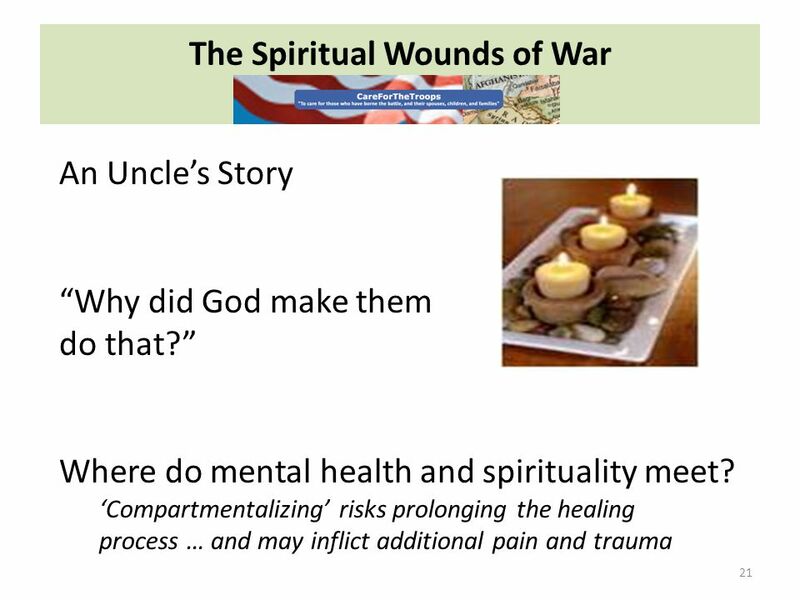 View of God as wrathful & punitive is linked to increased substance use Gorsuch, R. L. (1995). 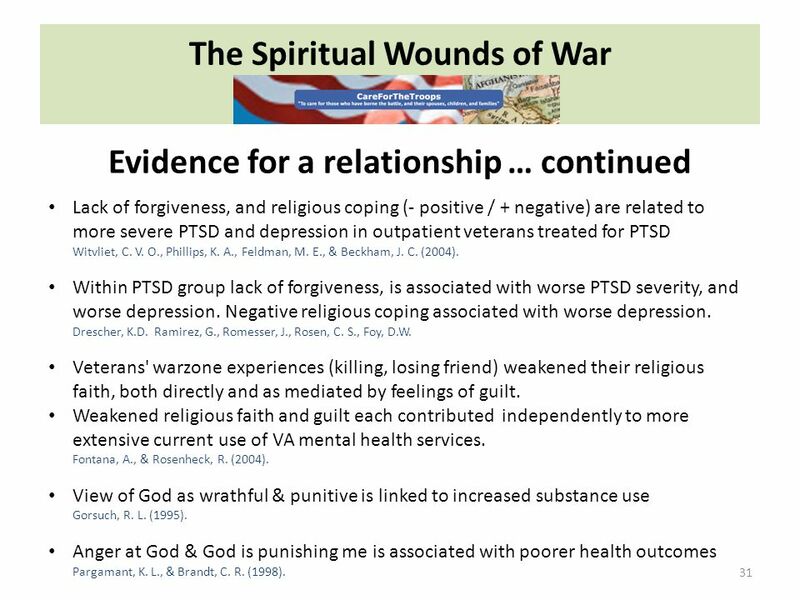 Anger at God & God is punishing me is associated with poorer health outcomes Pargamant, K. L., & Brandt, C. R. (1998). 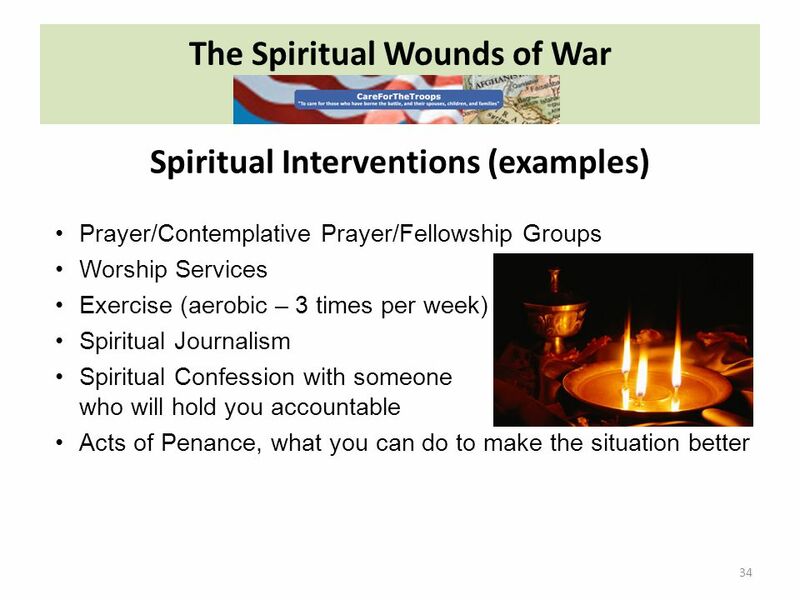 37 The Spiritual Wounds of War 37 Make congregations a safe place for veterans Be alert for ritual opportunities within your faith tradition Encourage veterans to meet with clergy, ushers in order to identify a safe place to mitigate panic Be supportive of vets who need to wear sunglasses (for safety or to protect eyes from intense light) Become sanctuaries of support- e.g. 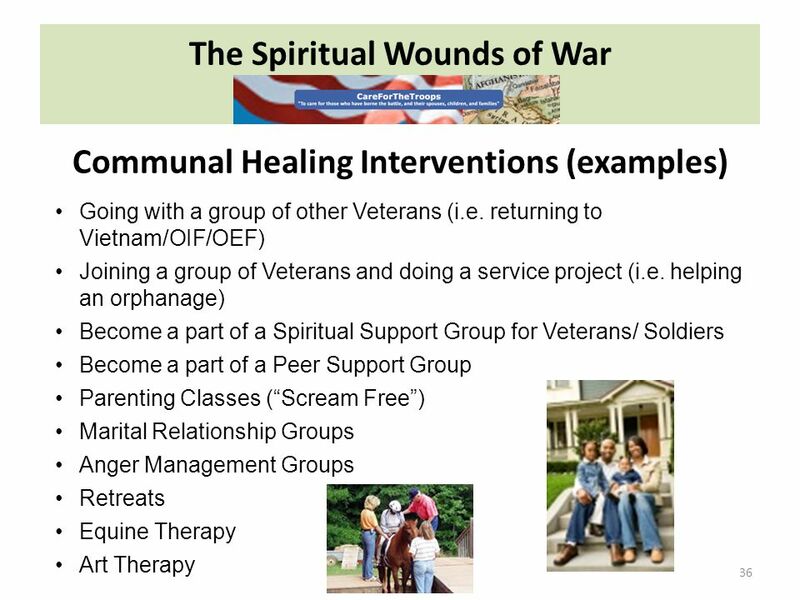 offer veterans peer support groups Offer ways to participate/volunteer that fit needs as well as skills Coach staff to minimize questions And …. 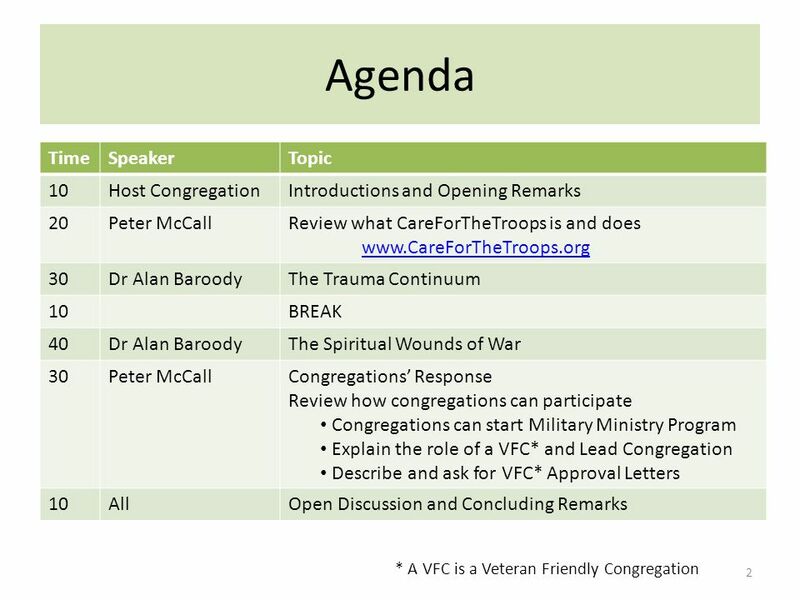 Consider the CareForTheTroops Veteran Friendly Congregation Military Ministry approach that is about to be presented !! 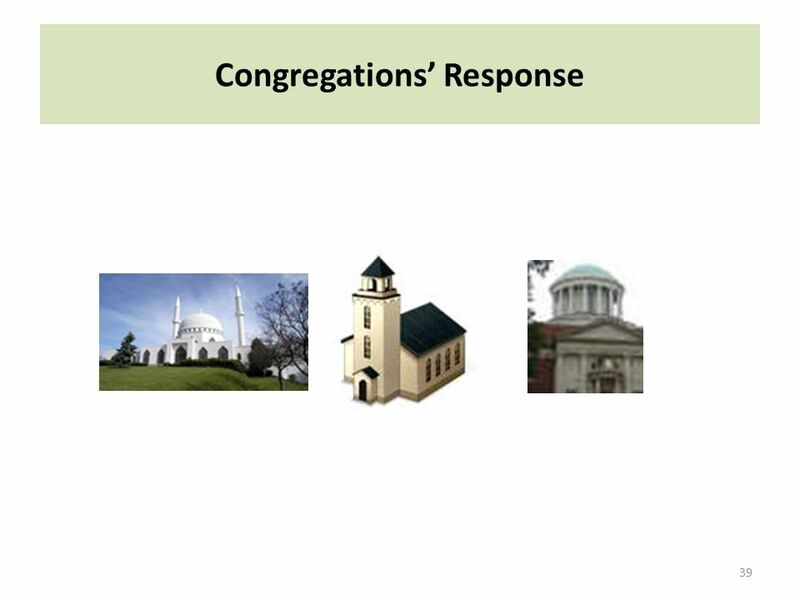 How Can Congregation Communities Respond? 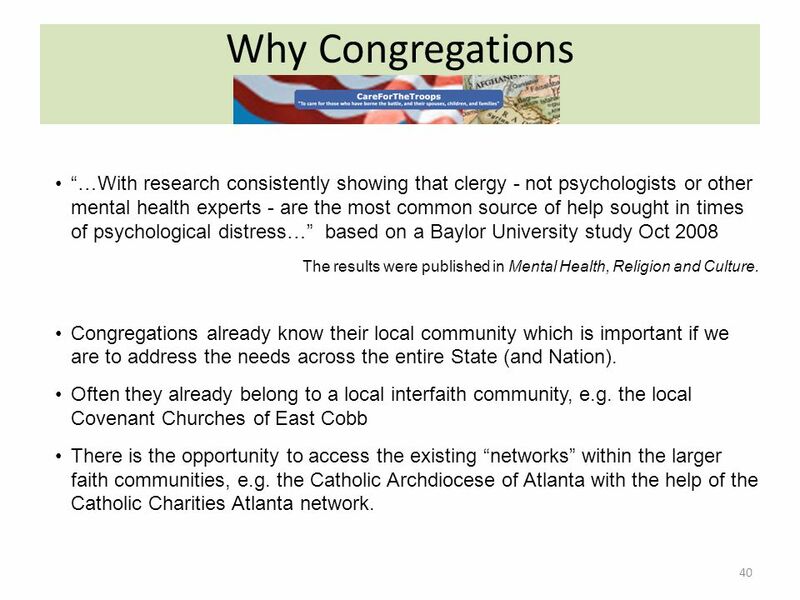 40 Why Congregations 40 …With research consistently showing that clergy - not psychologists or other mental health experts - are the most common source of help sought in times of psychological distress… based on a Baylor University study Oct 2008 The results were published in Mental Health, Religion and Culture. 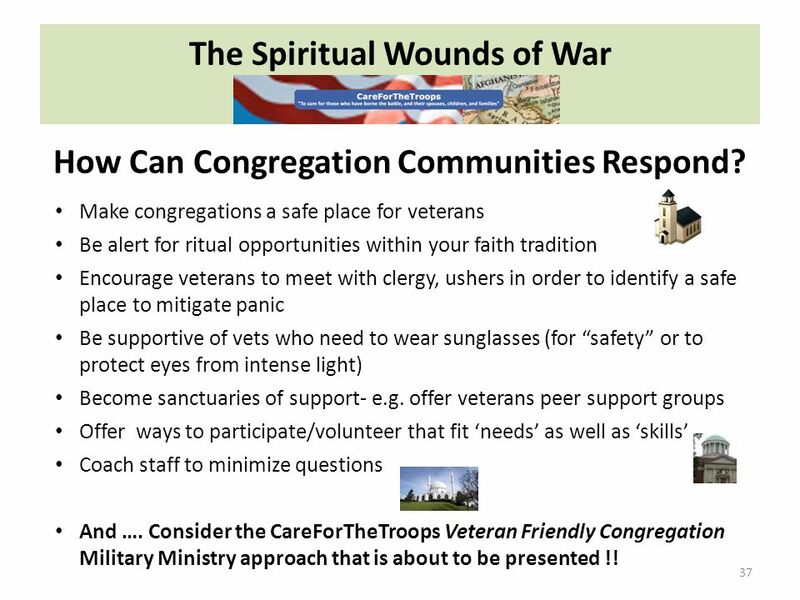 Congregations already know their local community which is important if we are to address the needs across the entire State (and Nation). Often they already belong to a local interfaith community, e.g. 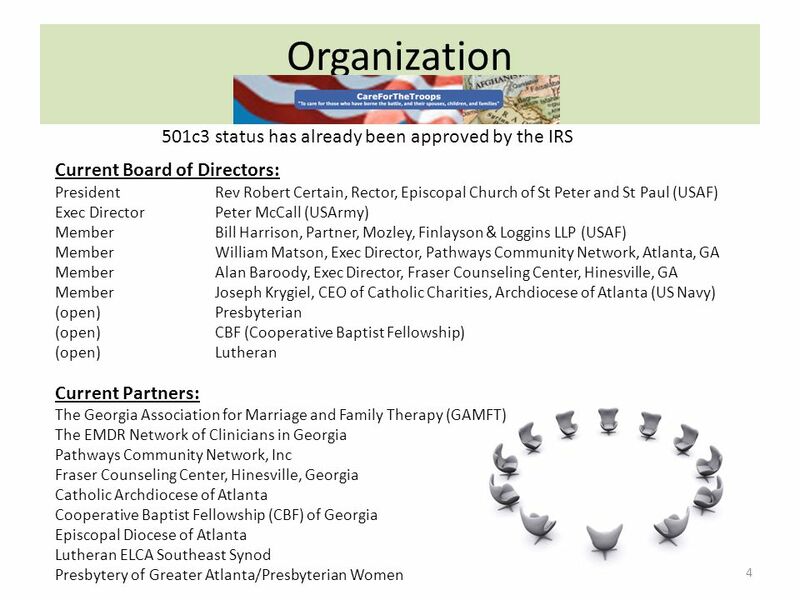 the local Covenant Churches of East Cobb There is the opportunity to access the existing networks within the larger faith communities, e.g. 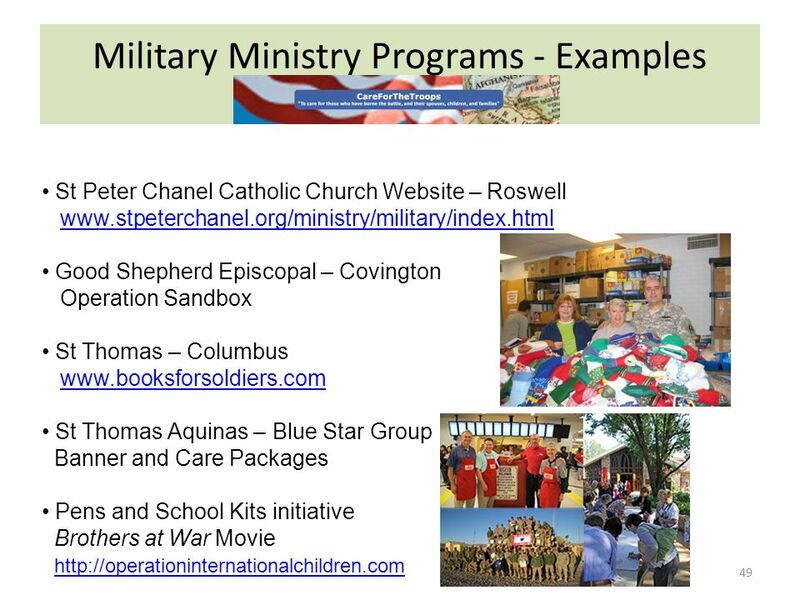 the Catholic Archdiocese of Atlanta with the help of the Catholic Charities Atlanta network. 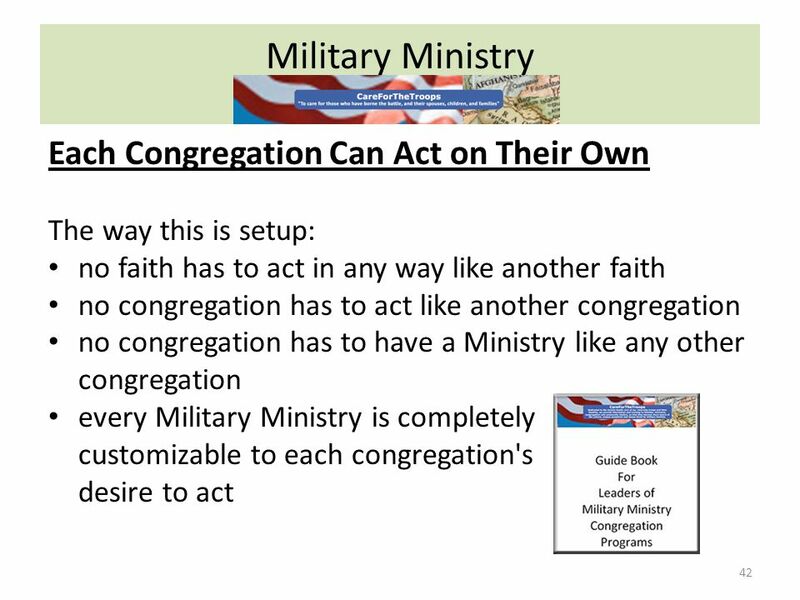 41 Military Ministry 41 Purpose The ministry approach is intended to address all the extended family members associated with the person that is or has been in the military. 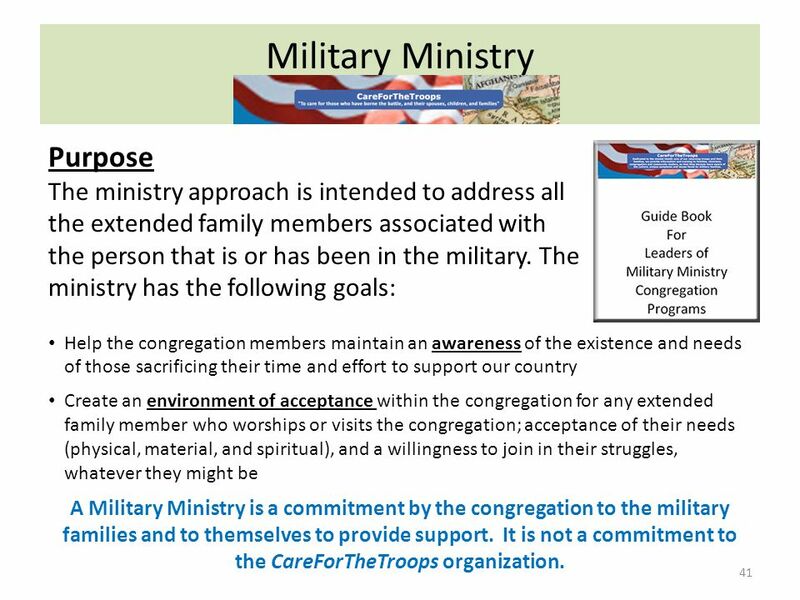 The ministry has the following goals: Help the congregation members maintain an awareness of the existence and needs of those sacrificing their time and effort to support our country Create an environment of acceptance within the congregation for any extended family member who worships or visits the congregation; acceptance of their needs (physical, material, and spiritual), and a willingness to join in their struggles, whatever they might be A Military Ministry is a commitment by the congregation to the military families and to themselves to provide support. 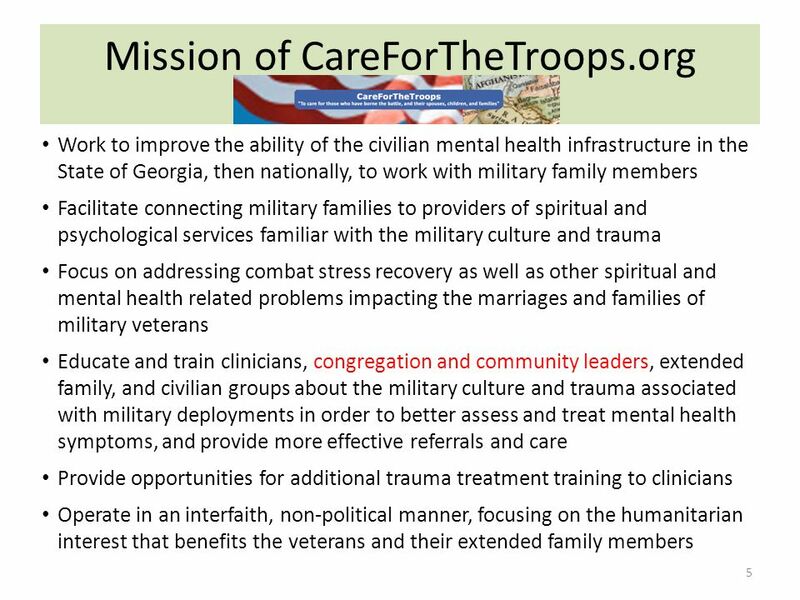 It is not a commitment to the CareForTheTroops organization. 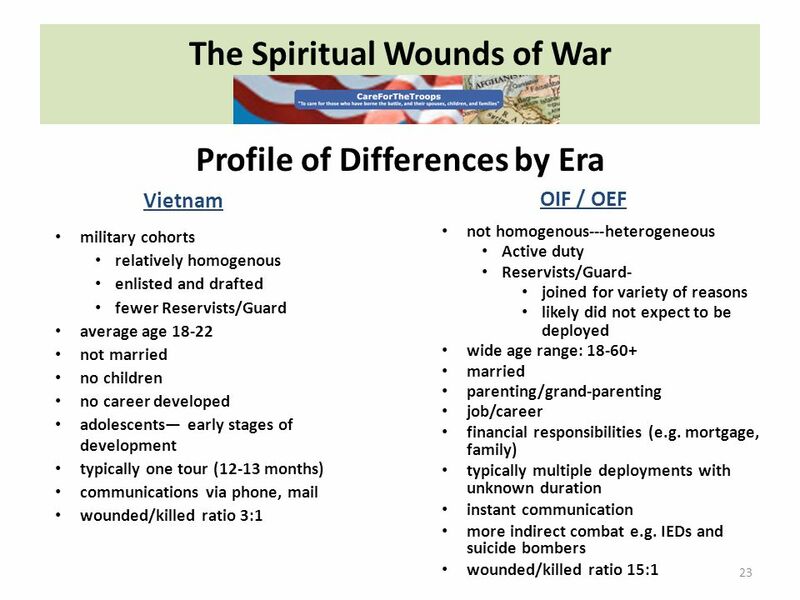 45 Moving down the same page gets you to the Guide Book info we have introduced in this presentation. 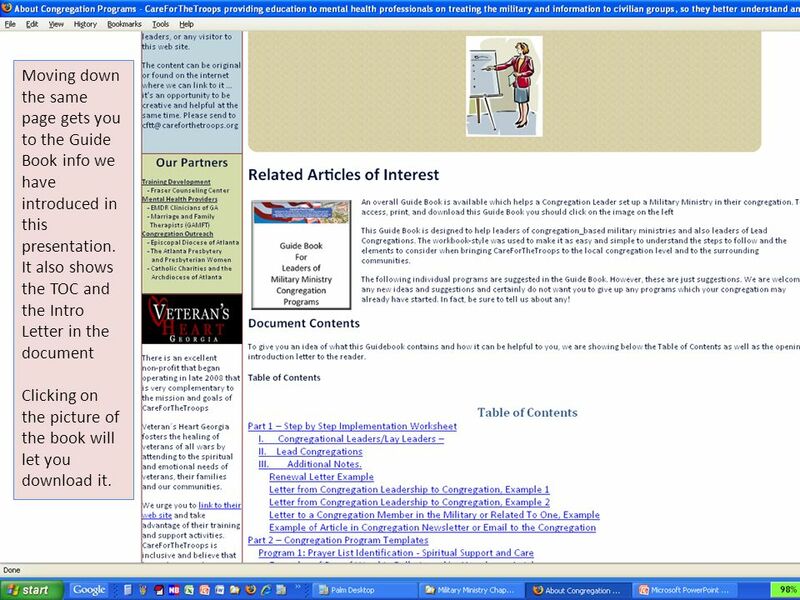 It also shows the TOC and the Intro Letter in the document Clicking on the picture of the book will let you download it. 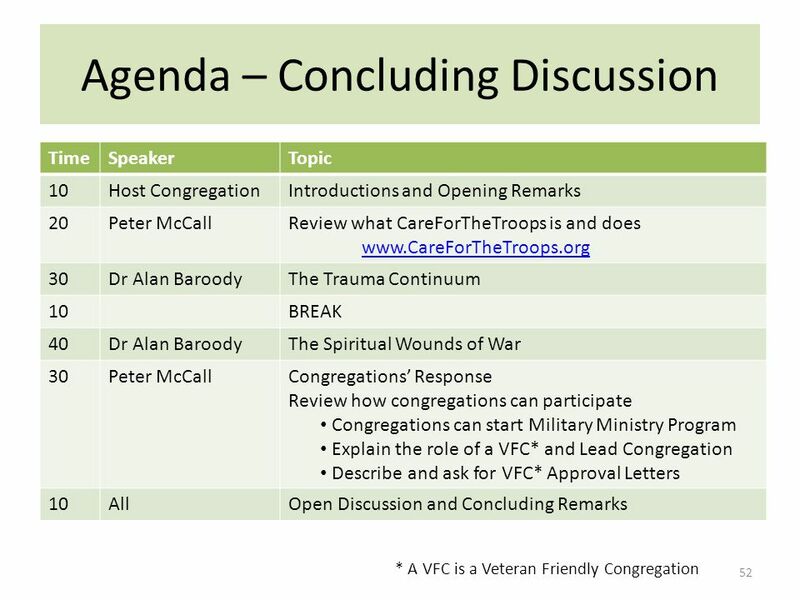 47 Veteran Friendly Congregation (VFC) 47 www.CareForTheTroops.org/about_programs.php Program Requirements Any congregation that meets the following criteria qualifies on an annual basis. 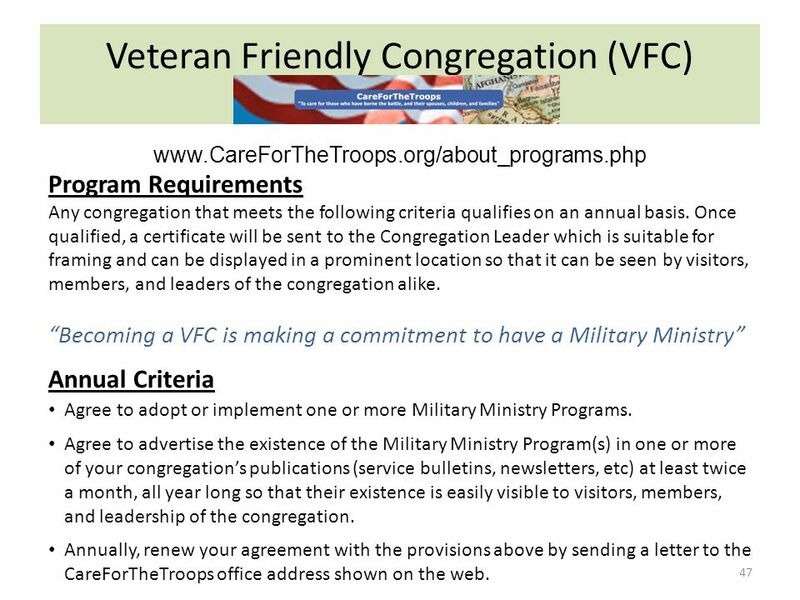 Once qualified, a certificate will be sent to the Congregation Leader which is suitable for framing and can be displayed in a prominent location so that it can be seen by visitors, members, and leaders of the congregation alike. 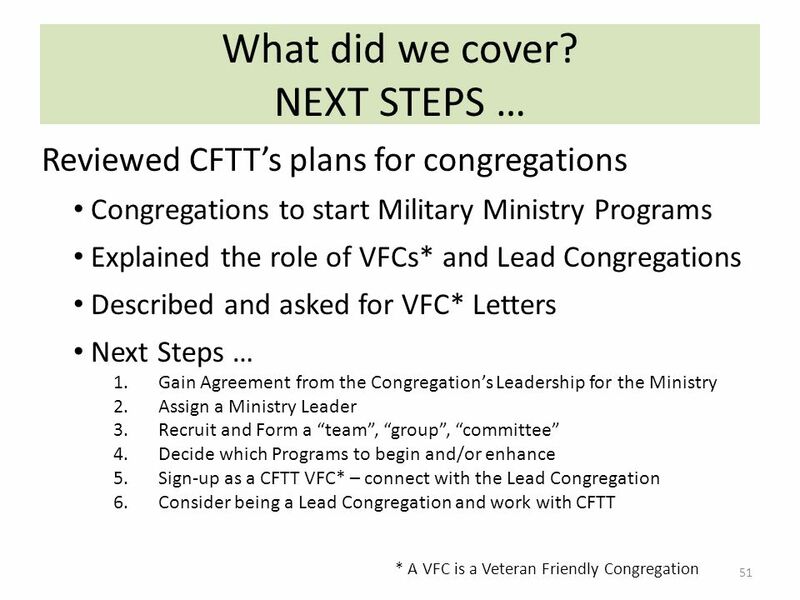 Becoming a VFC is making a commitment to have a Military Ministry Annual Criteria Agree to adopt or implement one or more Military Ministry Programs. 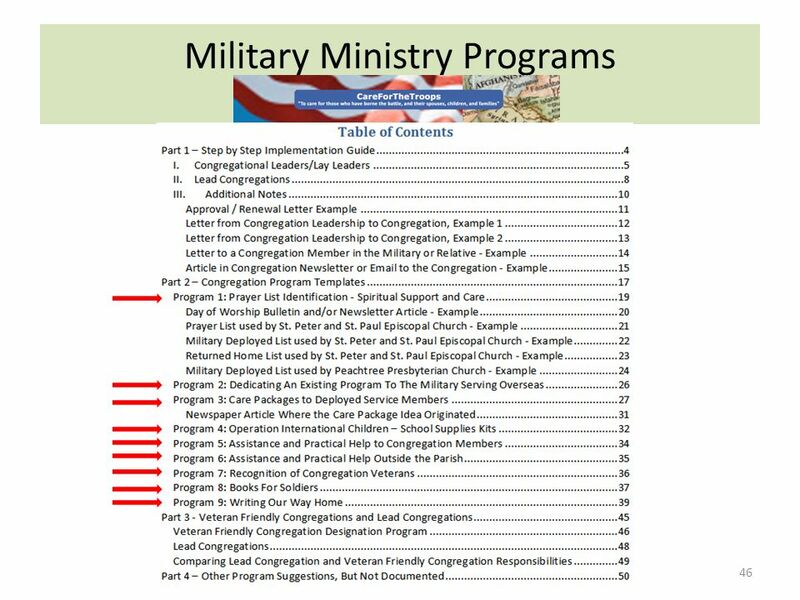 Agree to advertise the existence of the Military Ministry Program(s) in one or more of your congregations publications (service bulletins, newsletters, etc) at least twice a month, all year long so that their existence is easily visible to visitors, members, and leadership of the congregation. 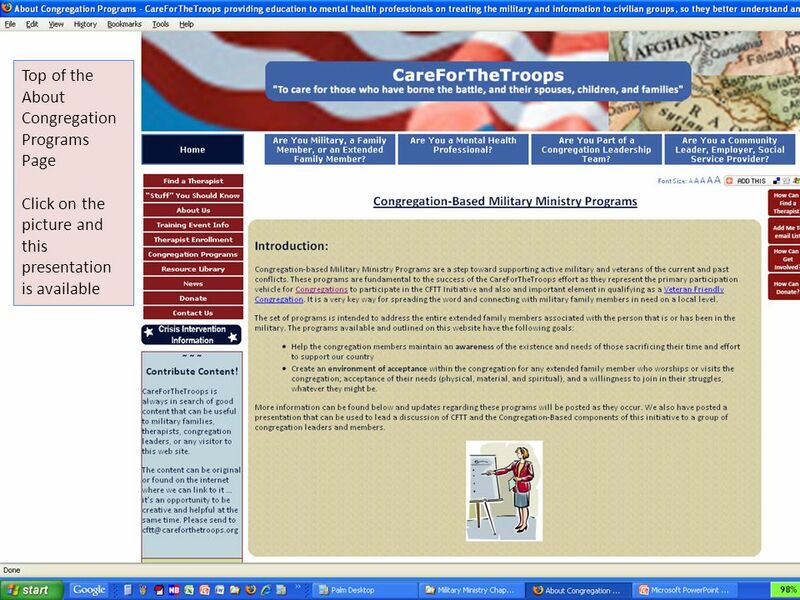 Annually, renew your agreement with the provisions above by sending a letter to the CareForTheTroops office address shown on the web. 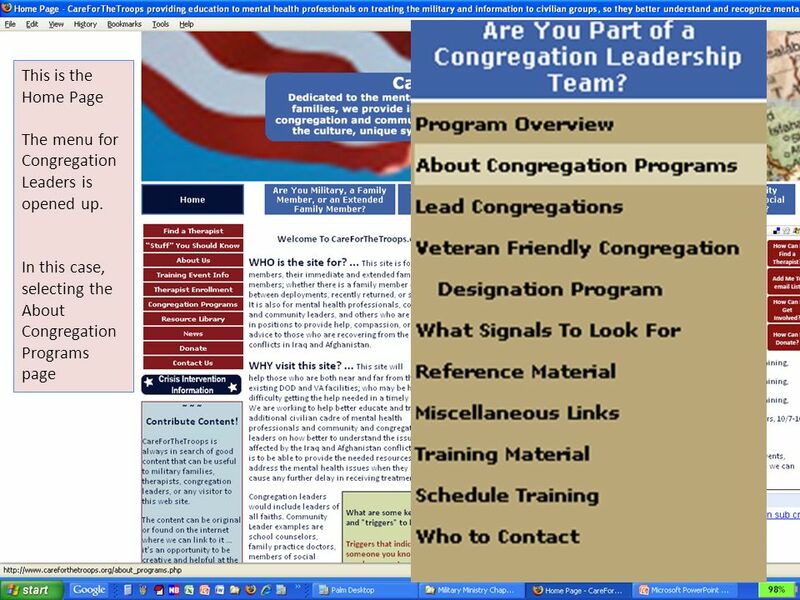 48 Lead Congregation 48 Program Requirements Lead Congregations are the LEADERS in their geography and become the organization responsible for spreading the word about this help. 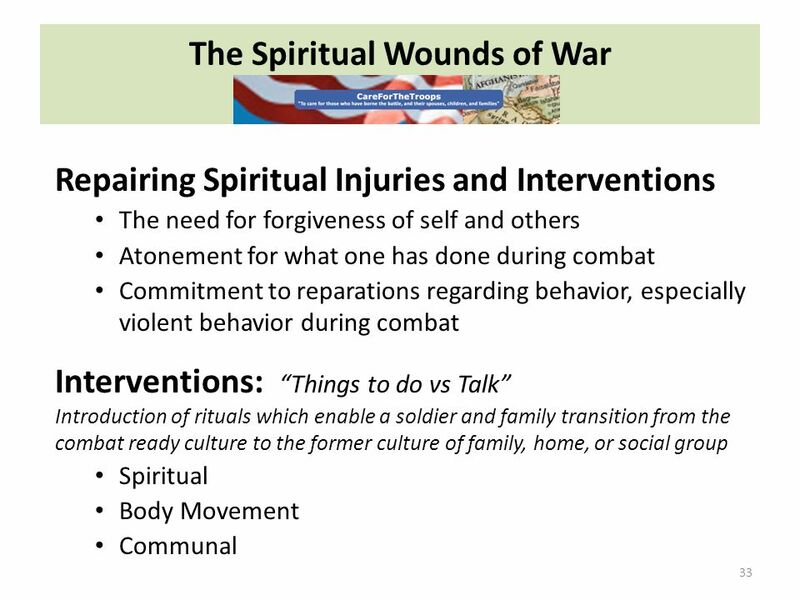 We can't rely on a group in Atlanta to spread this across the State and the Nation. 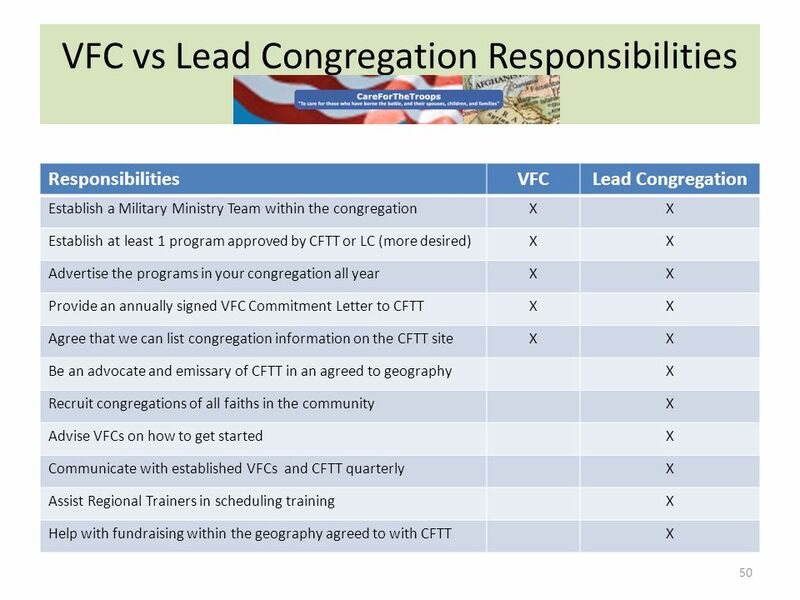 Annual Criteria Be an overall advocate and emissary of the CareForTheTroops initiative Recruit congregations of all faiths on the merits of developing a military ministry Providing feedback to CFTT on how the programs are being used and any improvements that are needed to the documentation Feedback on new ideas and programs discovered while speaking with other congregations that they have already implemented Assistance to the Regional Trainers with scheduling presentations and events Help with fundraising if local foundations or private benefactors are involved. 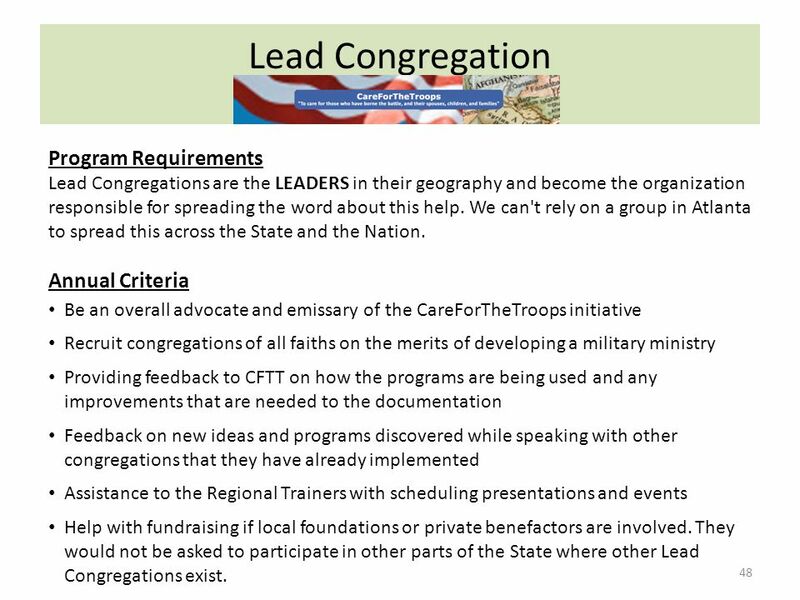 They would not be asked to participate in other parts of the State where other Lead Congregations exist. 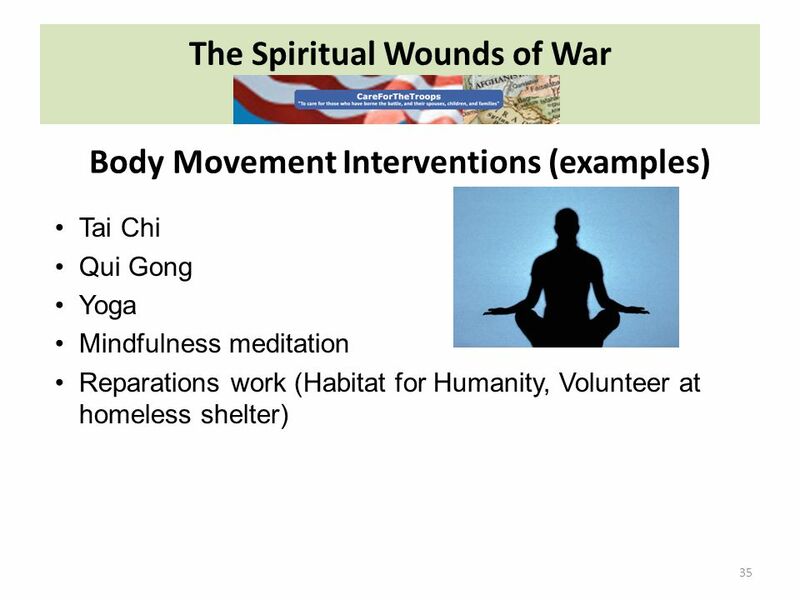 Download ppt "Www.CareForTheTroops.org Addressing The Invisible Wounds of War Mission: … facilitating the spiritual and psychological care of returning war veterans." 1. Lauren W. Schneider, LCSW Clinical Director of Children’s Programs Lenna Lebovich, MFT School Program Coordinator OUR HOUSE Grief Support Center 1663. UIC / HBHC Treatment Advocacy Program Main Menu TAP: HIV Communication 12/9/03 1 The University of Illinois at Chicago Howard Brown Health Center Treatment. 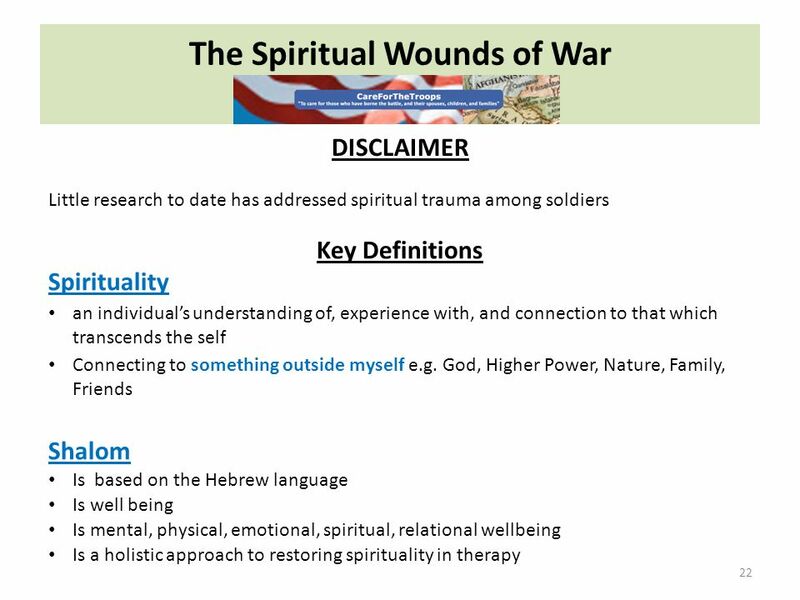 Trauma and Substance Abuse An Introduction to Trauma-Informed Care Hoyt Roberson, MC, MS Licensed Marriage and Family Therapist Presbyterian Medical Services. 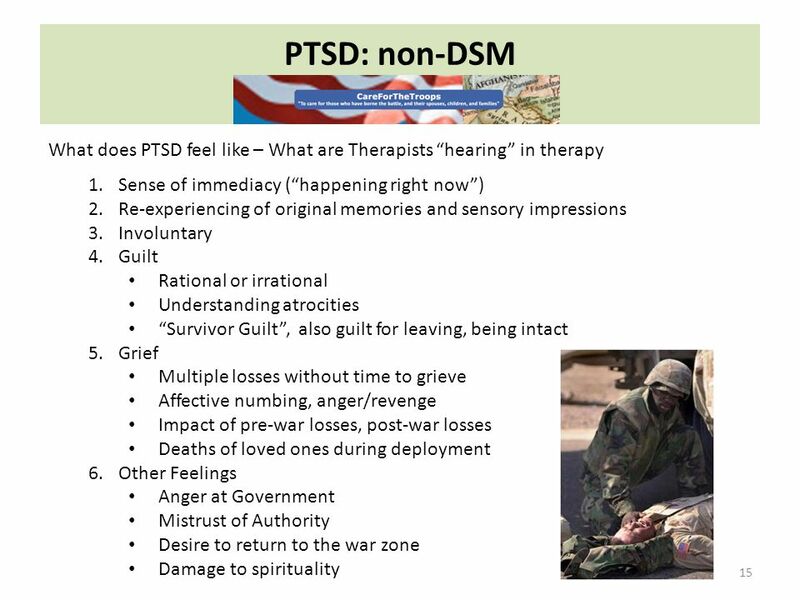 Post Traumatic Stress Disorder (PTSD) What is PTSD? 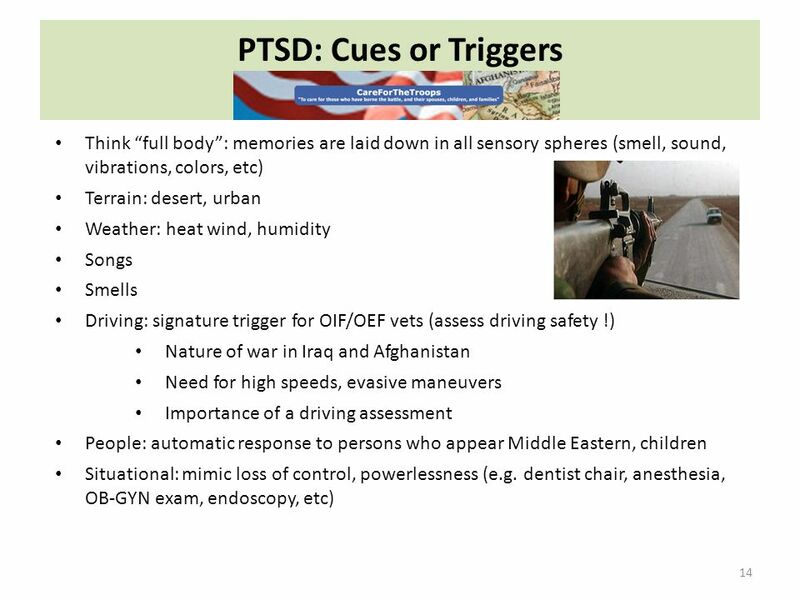 Issues Facing Combat Veterans. 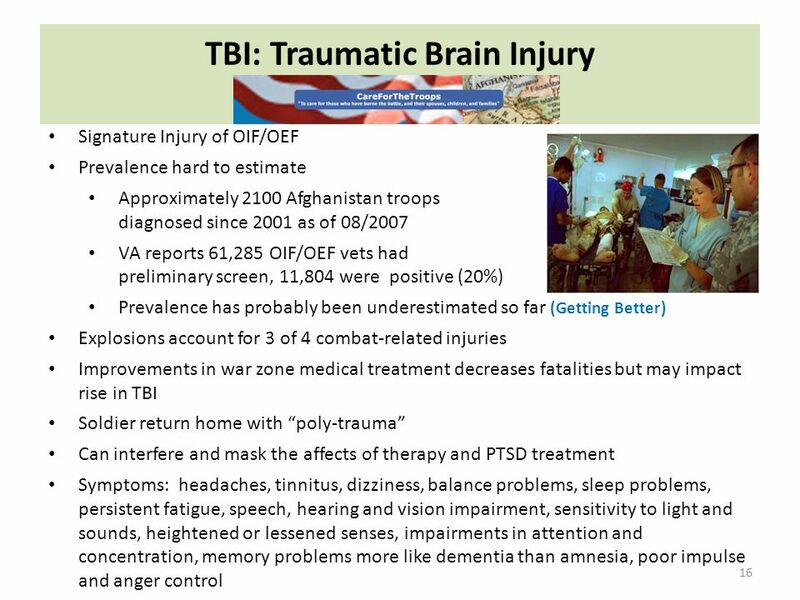 Agenda Virginia Wounded Warrior Program (VWWP) Population Description – Paradox of Coming Home – Traumatic Brain Injury. 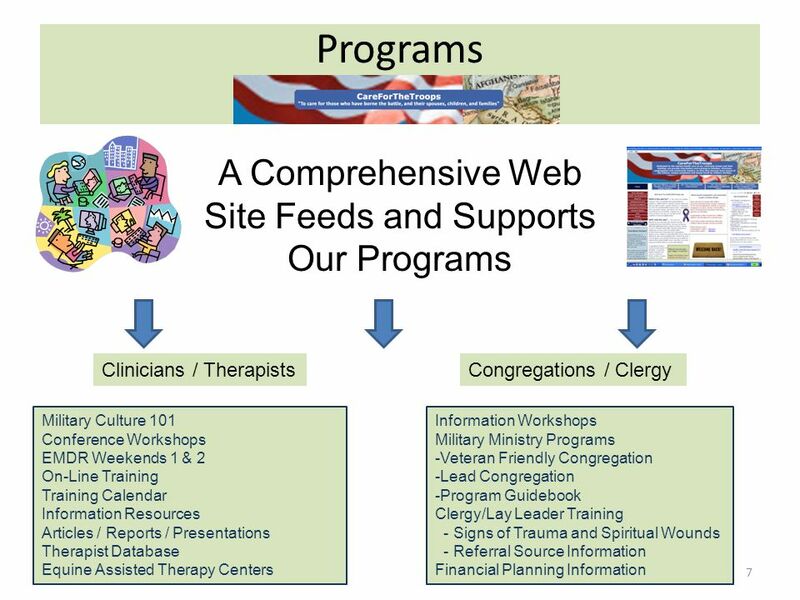 Hospice Veteran Volunteers Outreach and Support Recruitment, Utilization and Support. 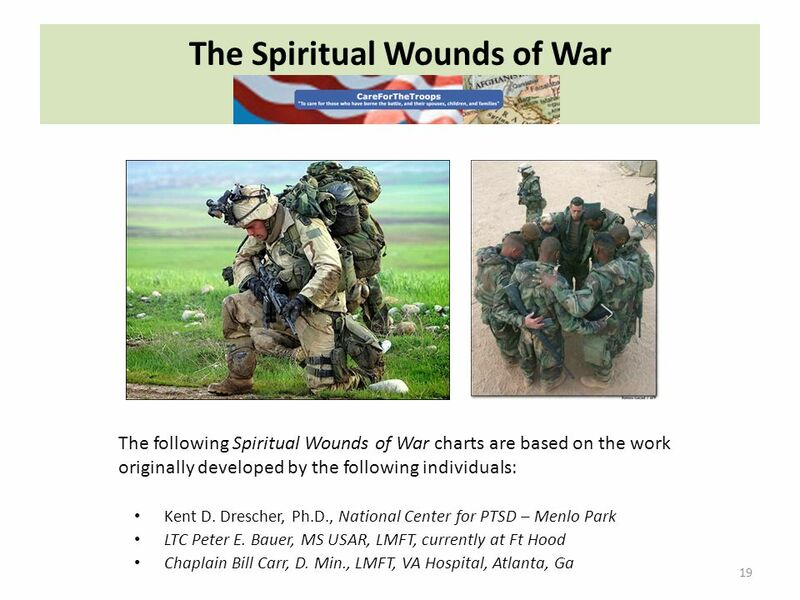 Caring for Veterans Caring for Families Forrest L. Kirk, Th.M., BCC Chief, Chaplain Service Jack C. Montgomery VA Medical Center. 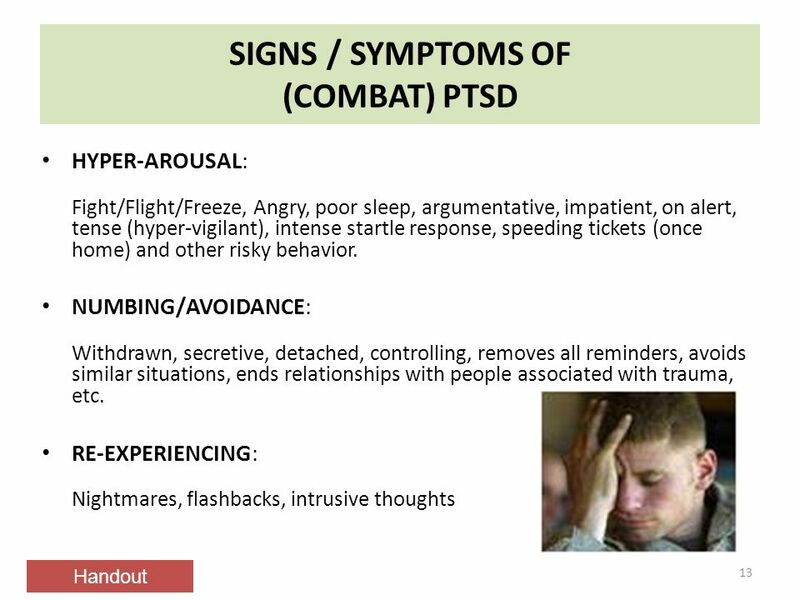 SOAR: Mental Health Trauma Intervention Program Robert Niezgoda, MPH Taney County Health Department September 2014. The Shattered Soul Life in the Balance. 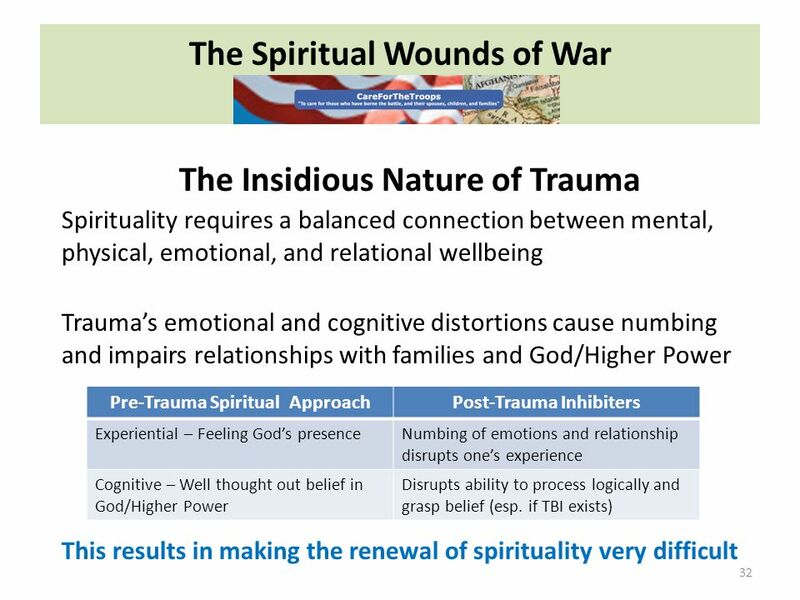 2 Spiritual Reactions to Trauma 1. Confusion about God 2. Altered sense of meaning in/of life 3. 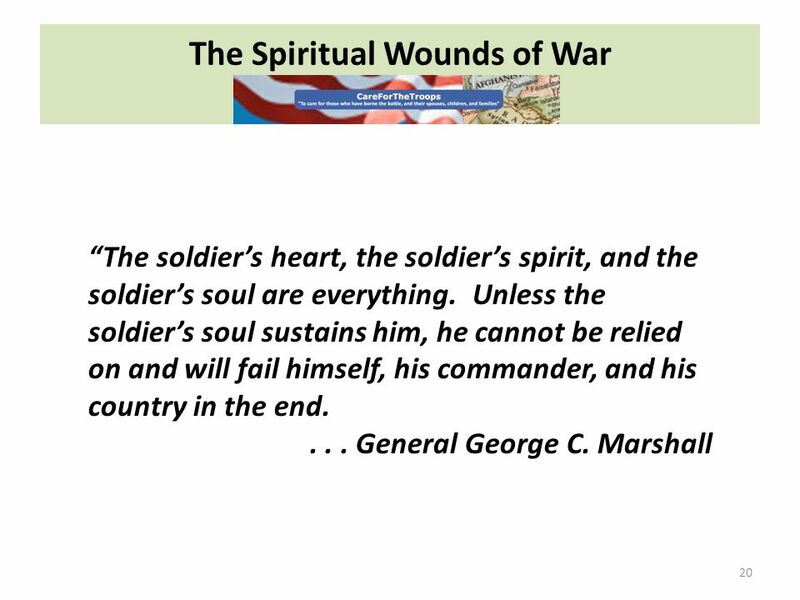 Grief and loss. 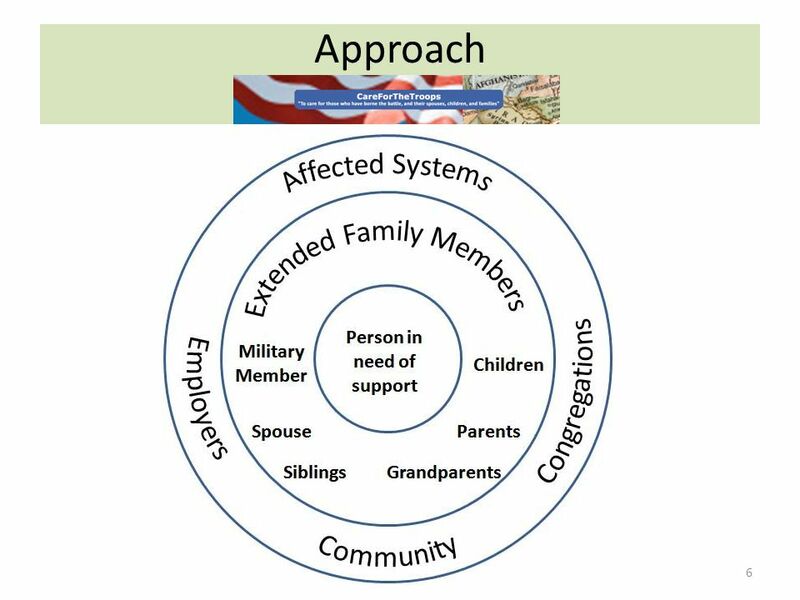 Module 5 - Populations with Special Needs. Module 5 Populations with Special Needs 2 Learning Objectives Identify and describe the characteristic reactions. 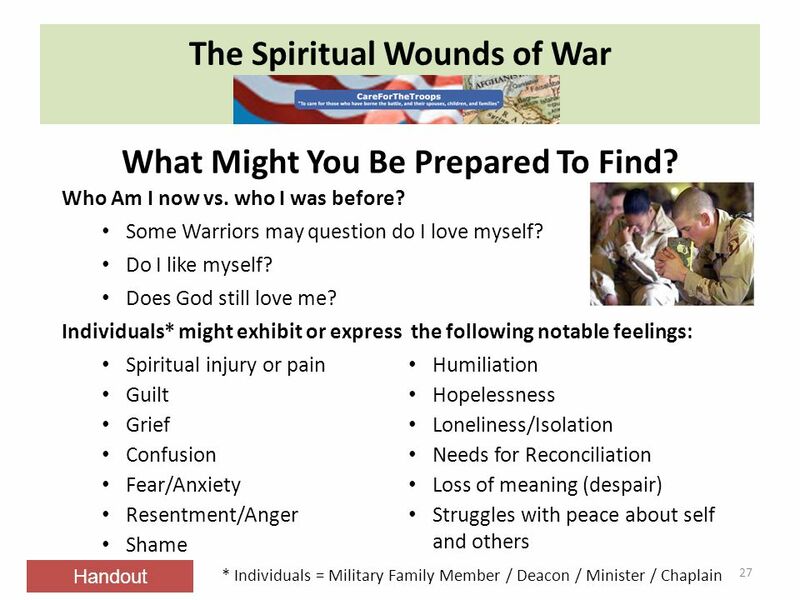 Student Veterans on Campus: Make the Connection PRESENTED BY: CEDERICK VICTOR, LMSW, TEAM LEADER AUSTIN WAMPLER, BA, READJUSTMENT COUNSELOR.  According to the Admissions Office, 7116 undergraduates were admitted and paid their fees for the Fall 2011 quarter.  1.6% of those students are a.